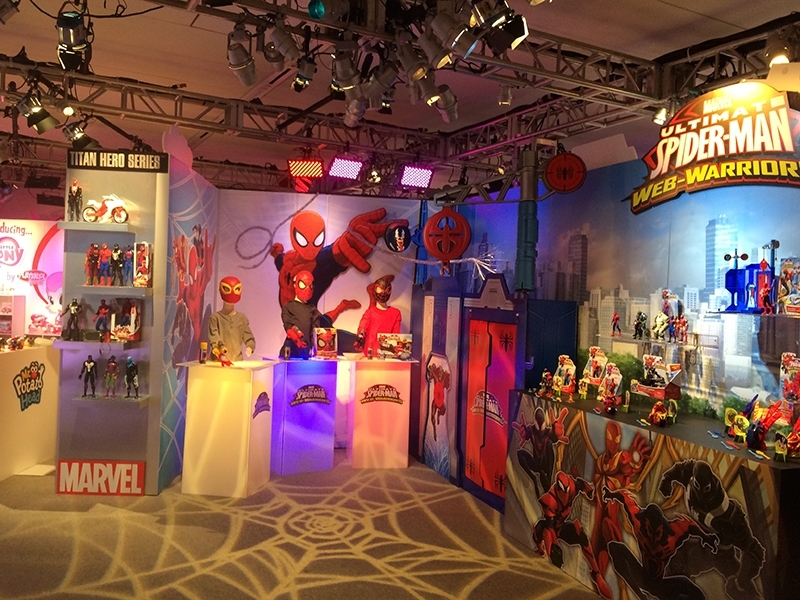 Hasbro and IPS Choose 4Wall for Seventh Consecutive Year | Press Center | 4Wall Entertainment, Inc.
New York, NY- For toy manufacturers around the world, the annual Toyfair convention in NYC is the kick-off to the year. It's the place where new toys are seen by the public for the first time, with buyers and distributors getting a first look at the goods that will be gracing their shelves throughout the year. For manufacturing giant Hasbro, the confines of the Javitz Center simply don't leave enough room for the brand to display all the new offerings from their many entities. Marvel, Star Wars, Transformers, and G.I. Joe are just a few of the properties that lead Hasbro to utilize their own multi-level venue during Toyfair: The Times Center located at 242 West 41st Street near Times Square. Lighting Designer Kenneth Farley of Illumination Production Services Inc., has worked with Hasbro at Toyfair since 1987, and has been the Lead Designer since 1992. Throughout his time working on the show, the goal from the Hasbro team has been the same: make the environment fun! "We always set out to make the showroom a fun environment, while providing enough variation that the customer doesn't get bored walking through it," said Farley. To meet this goal, Farley uses color and texture to support exhibit themes for each product, which can range from outdoor scenes and interior rooms to concert stages, and more. Each area must be intimate and focused on the products. Small action figures must be highlighted in a way that draws attention to the incredibly intricate detail. Farley turned to 4Wall New York for the lighting package needed to augment a stock of Hasbro-owned museum grade LSI units and Chauvet Light Pallets. 4Wall's Arri Fresnels, both 300W and 150W, were chosen to handle demonstration tables and featured products. GLP Impression X4S LED moving lights were used in the lower lobby of the building, as well as in a simulated concert stage area showcasing yet another well-known Hasbro brand, Littlest Pet Shop. "The smaller size of the X4S made them a perfect fixture for our 12' ceilings," said Farley. The designer also chose Chroma-Q Color Force LED battens of various sizes to provide truss warming and color amongst gaming areas, demo tables, and more. The entire look would not be possible however without a structure in place to support it- in this case, a grid utilizing 1,600 ft. of 4Wall-provided Tomcat Truss. After another successful event in 2015, Farley credited the entire IPS team, including Lighting Designers Adam Macks, Brian Aldous, Rich Latta, and Chris Brown, as well as Production Electrician Josh Starr. "Josh managed the crew and the formidable power distribution challenges, and our Designers brought their vision to each area while also focusing the more than 700 fixtures used in the show," Farley said. Farley also praised 4Wall for continuing to help build upon a relationship now bordering on a decade. "4Wall has been a great partner for the last seven years of the show, providing support from pre-production all the way through the show. There were several times the client made last minute requests or we needed extra parts, and 4Wall had the equipment to us within hours."